At National Spine Care, we are pleased to offer Graston Technique to our patients. Graston Technique is an evidence-based form of instrument-assisted soft tissue mobilization that enables us to address effectively scar tissue and fascial restrictions. The Graston technique uses specially designed stainless steel instruments, along with appropriate therapeutic exercise, to detect specifically and effectively treat areas exhibiting soft tissue fibrosis or chronic inflammation. The instruments also are used diagnostically to follow the kinetic chain, to locate and treat the cause of the symptom as well as the specific area of pain or scar tissue. 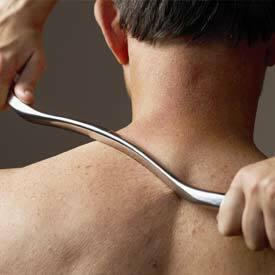 Scar tissue (also referred to as adhesions) results from injury to the soft tissue. Normally, when we move, our soft tissues slide over each other, allowing for the fluid movement of muscles, tendons, ligaments and surrounding soft tissues. Scar tissue binds the tissues together, preventing this fluid movement. So if you feel tight, or have pain with movement, it could very well be due to this binding effect of scar tissue. Graston technique breaks down these scar tissue adhesions, which frees up our movements by allowing the soft tissues to slide over one another again. This soft tissue treatment utilizes patented stainless steel instruments, uniquely designed to treat various parts of the body. A key benefit is that you are able to continue to participate in your normal activities while undergoing treatment. book your Calgary Graston Technique consultation appointment today!